It seems to me that most home owners put very little effort into research before they first list a home for sale. They put a lot of thought into WHY they want to move, and they put a lot of thought into WHERE they want to move, but I am amazed at the lack of research home sellers perform before they decide WHO they want to hire to help them move. More than 60% of people who list a home for sale (for the first time) end up failing to sell their home, so they find themselves in a frustratingly difficult situation that could have been avoided. In the real estate graph below, we track all of the homes that "leave" the market every day. They either leave because they were sold (success), or they leave for any other reason (failure). 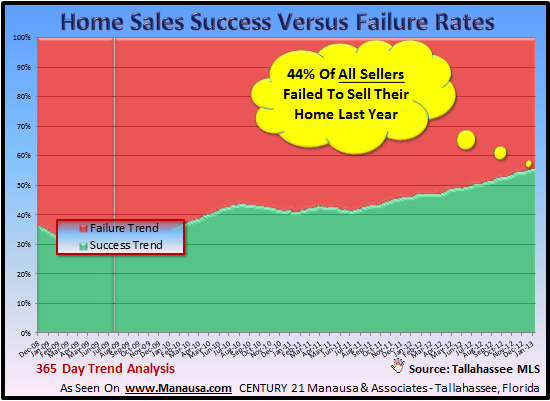 Currently, 44% of all home sellers are failing, and many of these sellers are on their third (or more) real estate listing agent! Can you imagine knowing WHERE, WHEN, and WHY you want to move, but not being able to go now because you didn't know WHO to move with? Fortunately, you don't have to list a home to discover who NOT to work with. You can figure that out online. The key to selling a home (the first time you list a home for sale) is by hiring the right real estate company who has a demonstrated edge on local marketing on the internet. No matter which REALTOR you choose to hire, your home will likely be listed for sale on all the national and international mega realty sites. Ironically, that's not where the ready buyers are. If you look at any of the research on where homebuyer's make their choices for viewing homes, you'll find that there is a dominant regional real estate site that has most of the traffic for people who will want to buy YOUR home. Why? Because the large sites can aggregate data and attract people who are starting the home buying process. This might be "exposure," but it's not the targeted exposure to the small group of people who might be interested in your specific home. The average homebuyer takes over 9 months to buy a home, so they progress from large, aggregate real estate sites to the local site that can give them everything they want. The prudent home seller will spend an hour on Google and discover THE local real estate site before they list a home for sale. Not A real estate site, but THE dominant player in the market. They might or might not be the largest company, but they likely will have the highest success rate when they list a home for a client. And that's what you care about as a home seller, right? You don't care how many agents they have or how many listings they have, or even how many homes they have sold, you simply want to know how effective they are at selling each home they list, correct? I mean, you're only hiring them to sell one home ... YOURS! If you are getting ready to move and need to sell a home, we can help. Our network of high quality real estate agents and real estate companies extends all around the world. In fact, we have helped unite home sellers with the "right" real estate company in almost every State (come on Montana ... give me a call!). Simply drop us a note and tell us that you would like our assistance in choosing the best real estate company with which to list a home in your market, and we will do the homework for you. We will help you schedule an interview(s) and even help you decide so that you can be sure that you will sell your home the first time. Of course, if you want or need to list a home in Tallahassee, please drop us a note and we will take the time to demonstrate to you WHY and HOW we dominate the internet and how we can expose your home IMMEDIATELY to ready buyers.